South Korea and the United States will hold bilateral "working group" consultations on North Korea as often as possible, either through face-to-face talks or videoconferencing, officials said Thursday. The allies launched the working group for more systemic and frequent discussions on ways to deal with Pyongyang amid concerns about a possible mismatch of progress in denuclearization talks and inter-Korean cooperation. The US wants the two things to proceed in tandem, while South Korea says an improvement in its relations with North Korea will help move forward denuclearization. "We plan to hold a working group session twice a month if possible," a government official told reporters on the customary condition of anonymity. "There will be some flexibility." If there's no special issue to discuss, the two sides may skip a session, he added. The working group is intended to focus on four main issues: diplomacy on North Korea, denuclearization, inter-Korean ties and the implementation of UN sanctions. 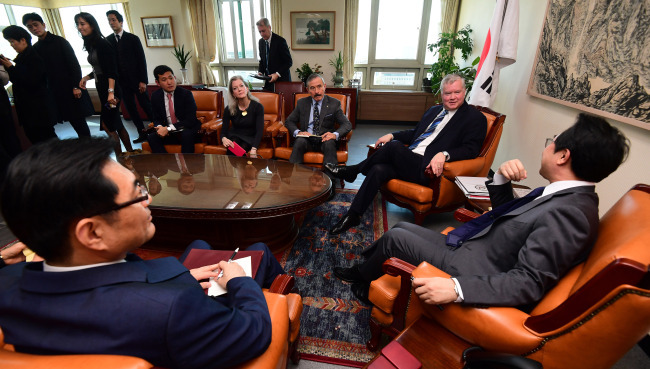 It involves officials from the presidential offices and foreign ministries of the two sides as well as South Korea's unification ministry in charge of inter-Korean cooperation. South Korea's team will be led by Lee Do-hoon, special representative for Korean Peninsula peace and security affairs at the Ministry of Foreign Affairs. His counterpart is Stephen Biegun, special representative for North Korea at the State Department. The inaugural session of the working group took place in Washington DC on Tuesday (local time), as Lee's team traveled there.